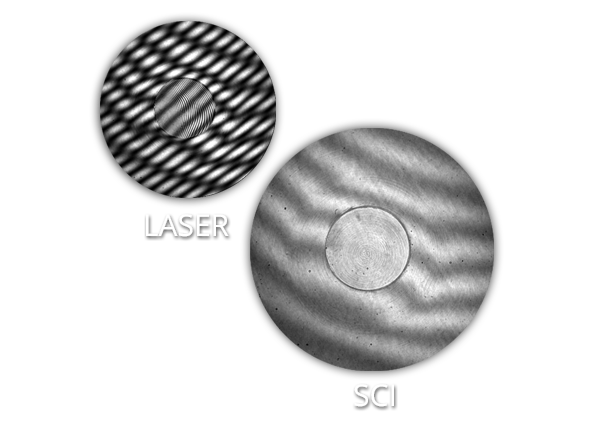 The laser Fizeau interferometer has experienced several transformations from its original design. Like all evolutionary processes, some vestigial design elements remain in commonly used interferometers, which do not address and can impede measurements required to control and optimize today’s optical manufacturing processes. 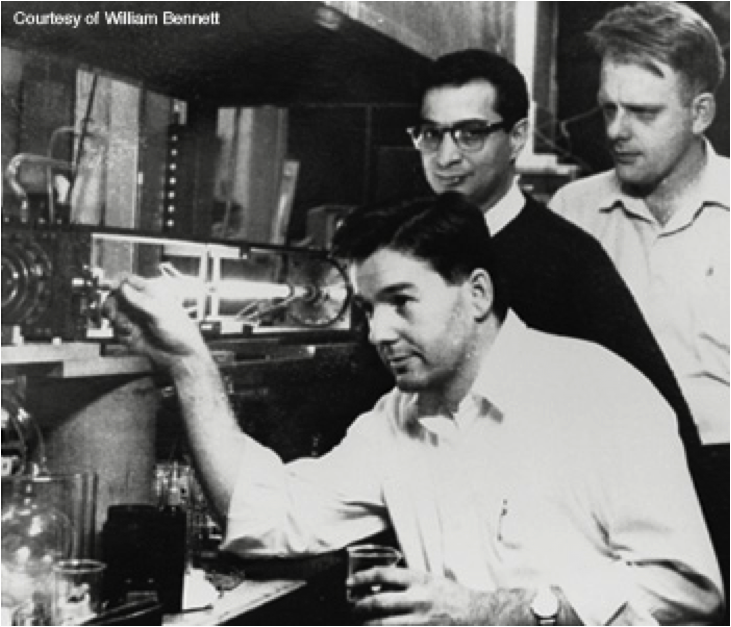 Before the invention of the laser in the 1960’s optical test interferometers were difficult to use and often had to be custom built for each application. Low-coherence illumination favored equal path interferometers like a Twyman-Green or Mach-Zehnder configuration. The Fizeau – though already commercially available – were large, very heavy, difficult to use and limited to measurements of flat surfaces. The laser made interferometry much easier to implement. 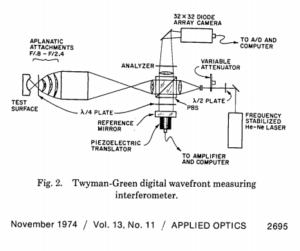 “Bob Hopkins…was quick to realize how much the laser could be used to improve the testing of optical components” (J.C. Wyant, “Short history of interferometric metrology”). With the laser, fringes were easy to find making interferometry a practical tool supporting optical manufacture. Much progress was made in testing configurations, yet interferometry remained an experts tool, custom made for the application and developed and run by engineers and scientists. 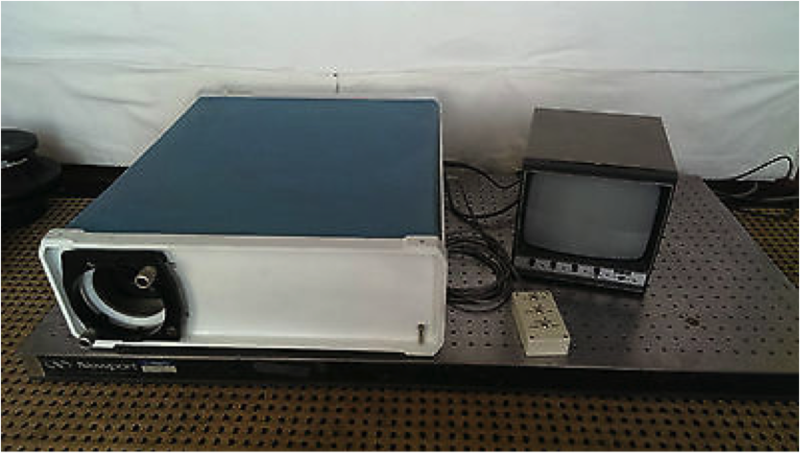 What is now considered a Fizeau interferometer was created in the 1970’s by two different events: The invention of the modular Fizeau interferometer with a laser source, plus computerized phase measurements. 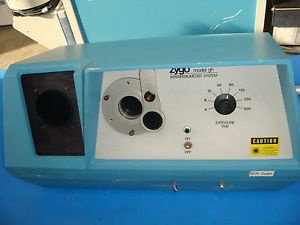 The HeNe laser made interferometers much easier to use, but it was not until 1972 when Carl Zanoni and George Hunter at ZYGO constructed the GH (for George Hunter the principle designer) and the follow-on Mark II™ in 1976 that modern interferometry was born. It is important to understand the architecture of the Mark II™ to know WHY interferometers are designed as they are today. The ZYGO innovation was an easy to use system architecture. The architecture combines an interferometer (“mainframe” in ZYGO terminology in a nod to the 1970’s Tektronix Oscilloscope architecture) with quickly interchangeable reference lenses/reference-surfaces they named transmission spheres (TS) and flats (TF). With the long working distance one TS eliminated the need for large libraries of Test Plates – bringing cost savings and convenience. 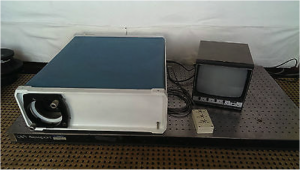 Plus Test Plates are used in virtual contact, separating the optical test surface from the reference surface eliminated the possibility of scratching and damage. Ease of use was augmented by the alignment system. The twin spot alignment visually indicated when the cavity alignment was close enough for interference fringes to be found. Now an office worker could align and configure an interferometer. The imaging system of Mark II™ REQUIRED a zoom lens to measure a wide range of part diameters since the only imager available was a vidicon camera sampled at ~128×128 equivalent pixels. Both the zoom lens and the vidicon produced back reflections and secondary fringe patterns. The solution was a rotating ground glass, “coherence buster”, at an intermediate image that was then imaged incoherently through the zoom lens and onto the vidicon. 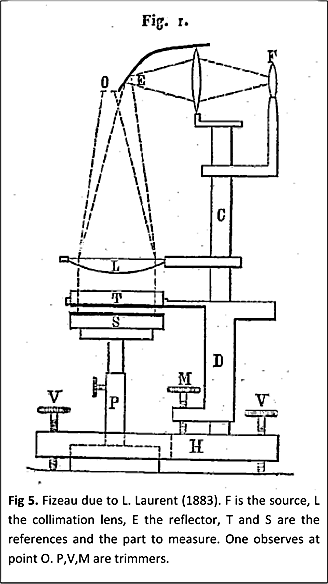 This design was so successful that even today’s interferometers with ground glass and 6X zoom are IDENTICAL to the optical system designed for the Mark II™. 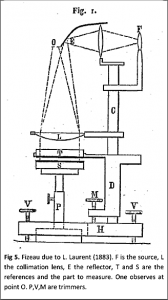 This is important to understand since the original optical system was designed for a 128×128 camera AND only considered the measurement of spherical and flat optics manufactured with pitch polished processes. 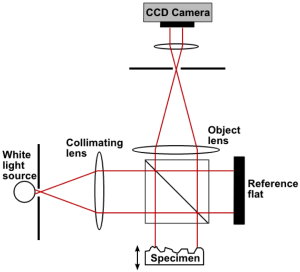 If a megapixel camera is used in this design, the magnification by the zoom lens is empty, meaning resolution is not increased and potentially degraded. Further, imaging distortion of one or two pixels at 128X128 was acceptable but is problematic when spot polishing techniques are employed that require interferometer feedback for correction. These limitations lead to the development of fixed or stepped magnification imaging systems in the 2000’s, to be discussed later. The historical influence of the Mark II™ optical architecture cannot be underestimated. All commercially successful interferometers follow the “mainframe” + Transmission Reference architecture. Plus commercially successful alternative optical imaging design were only developed in the 2000’s, where even today (2018) historical inertia drives buying decisions. Bell Labs created computer data acquisition phase measuring interferometry. John Bruning’s group and Tropel (now CORNING) worked together to develop the first phase measuring systems. There are some indications other groups were developing similar technologies around the same time, but Bell Labs patented the seminal technology. In the 1970’s Bell Labs was pushing the leading edge of semiconductor manufacturing technology. Lenses to support semiconductor manufacture were difficult to build due to their, at the time, extreme tolerances. Conventional visual or fringe center data analysis was not sufficient. Minicomputers were available and enabled in-the-lab data acquisition, as opposed to central batch processing of a few years earlier. Add to this signal processing was a core technology at Bell Labs. This combination enabled retrieving interferogram phase, pixel by pixel, an innovation that started the explosion of development that has continued until today. Phase acquisition was achieved by changing the interference cavity length by λ/4, stopping, capturing a camera frame, moving another λ/4 step, frame grab…until four camera frames were captured. A simple calculation eliminates the background intensity term and isolates the phase for each pixel. This is commonly called Phase Stepping Interferometry. Phase Stepping was used to minimize errors due to phosphor hysteresis. TROPEL (CORNING) developed the first commercial computerized Phase Stepping systems. 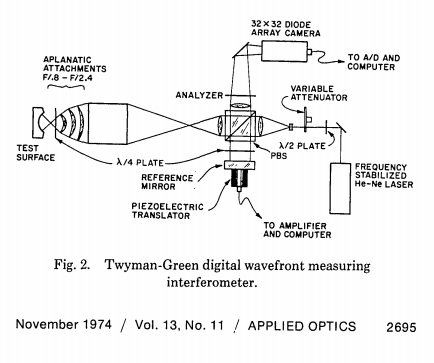 These were vertical laser interferometers that operated in the Twyman-Green and Fizeau mode. Data processing included a 32X32 array data acquisition off a vidicon tube camera. A few years later Jim Wyant at WYKO introduced Phase Shifting, where a phase was continuously swept and not stepped, improving accuracy and measurement speed. Developments in the 1980’s centered upon improving data acquisition. In-fact data acquisition was the locus of improvements over the next 20 years. ZYGO became the dominant provider of interferometers with TROPEL deciding to concentrate on in-house development supporting ultra-high accuracy metrology and application focused systems (to be discussed later). Digital cameras were now commercially available. The ZYGO Mark III™ had a 100 X 100 pixel array CCD and a home built board level computer with a frame grabber, with data acquired using a 4 frame data acquisition algorithm. The second half of the 1980’s saw the development of the ZYGO Mark IV™ with a “high-density processor” system with a 256×256 array CID camera. 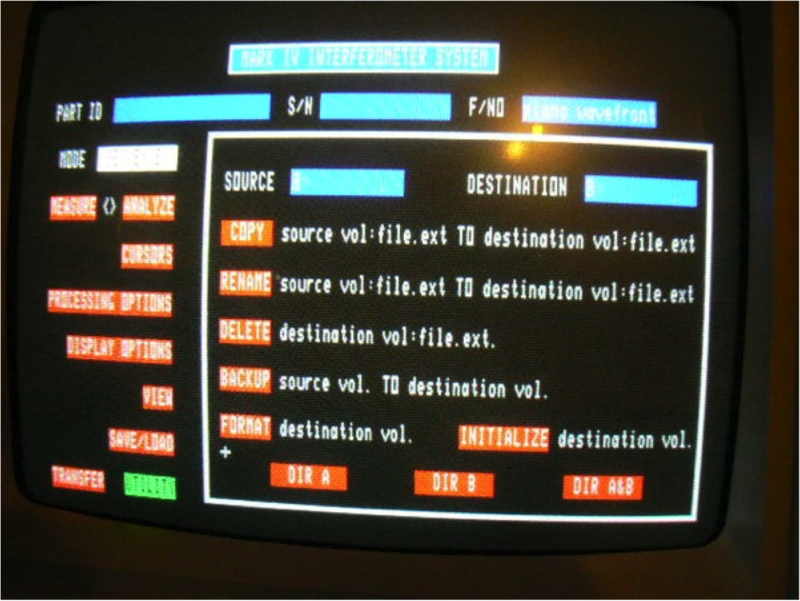 The Mark IV HDP system was based on ZYGO’s own computer, computer operating system and internally developed Basic-like software language that was then scripted into a user interface. The software package allowed for custom scripting which required intensive software support. The software was slow and expensive to develop, difficult to use and quickly out of date. In the 1980’s Wyko Corporation emerged to commercialize the phase shifting microscope and then the Fizeau interferometer. WYKO was innovative regarding data acquisition and software. Based on commercially available computers, operating systems and development software, innovative uses of cameras and phase modulators, WYKO data acquisition systems evolved more quickly than ZYGO. WYKO’s Innovation enabled the industry to quickly see the value of software to present easy to understand data and also employ algorithms to improve the quality and speed of data analysis. These innovations include color plots, extended analysis in MTF, PSF, and Fourier based analysis that pushed the industry forward. This competitive pressure drove ZYGO to develop MetroPro™ the program which became the industry standard software for the next 25 years. MetroPro™ was based on Objective-C an early and quickly obsolete programming language. Yet using the object oriented software gave MetroPro™ the flexibility to survive all those years. The competition between WYKO® and ZYGO® benefited the optics community tremendously as they challenged each other to improve. Two significant inventions that would not become commercially successful until the 2000’s were invented in the 1980’s: Carrier fringe [Takeda, H. Ina and S. Kobayashi] and multi-camera frame simultaneous interferometry [Smythe & Moore]. Both of these enable phase measurement at microsecond rates enabling interferometry in vibrating and turbulent environments. The Personal Computer revolution of the 1990’s and continuous improvements in semiconductor imaging (CCD’s) were the basis of most improvements in the 1990’s. The Mark II architecture was maintained and repackaged, while faster computers, improving software analysis and higher density cameras were added. A new concentration on algorithms occurred. It was seen that a robust algorithm could compensate for errors in the data acquisition and environment. 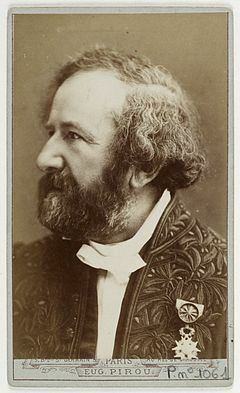 New multi-frame algorithms [Creath, Degroot] were created throughout this period. 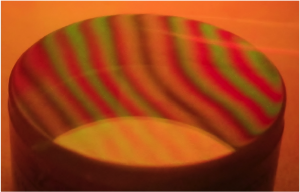 In tangential fields of speckle interferometry, vibration correction algorithms were being developed that would find their way into Fizeau interferometry after 2000. These so called Vibration Tolerant PSI algorithms make Fizeau Interferometry more accurate in environments where data can be obtained but ripple appears in the data. The growth of high volume manufacture in Asia led to new entrants. The relative expense of WYKO and ZYGO systems positioned them in the market as the R&D and QC standards for wavefront measurement and Fujinon and Olympus emerged as the small aperture interferometers providers for surface and wavefront production measurement. Molded optics, pioneered at KODAK in the USA in the early 1980’s, led to new consumer cameras and optical data storage devices driving the need for high volume asphere metrology. Interferometers were not able to measure these lenses or molds, leading to rise of stylus profilers from Taylor Hobson and Panasonic. 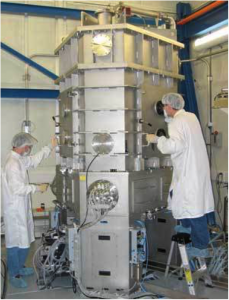 It was not until the early 2000’s that interferometers were developed to measure aspheres. 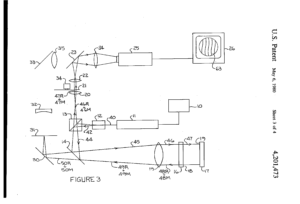 In the early 1990’s Dr. Michael Küchel, of Carl Zeiss, developed the Direct 100 laser Fizeau, a multi-wavelength optical interferometer with advanced optical architecture and data acquisition based on carrier fringe. Custom electronics acquired data at frame rates. The Direct 100 architecture is still employed today in some non-commercial applications. 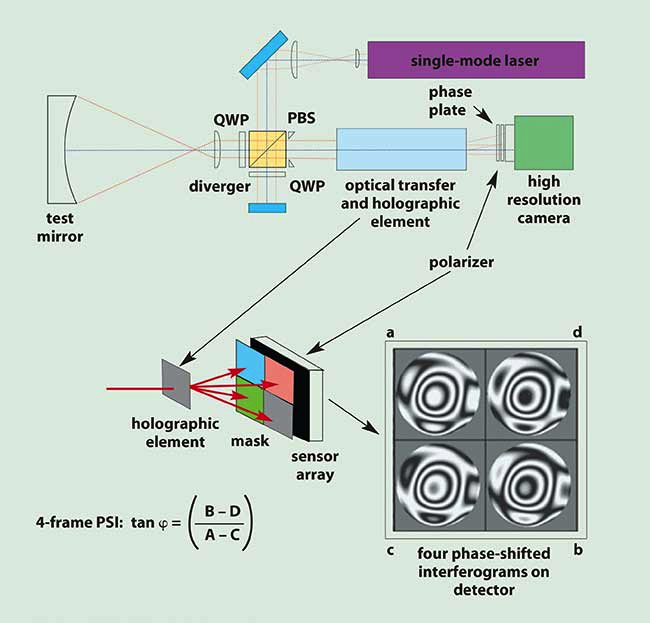 Phase Shift Technology also introduced a multi-camera interferometer on a custom basis. The expense of these interferometers limited their commercial success. 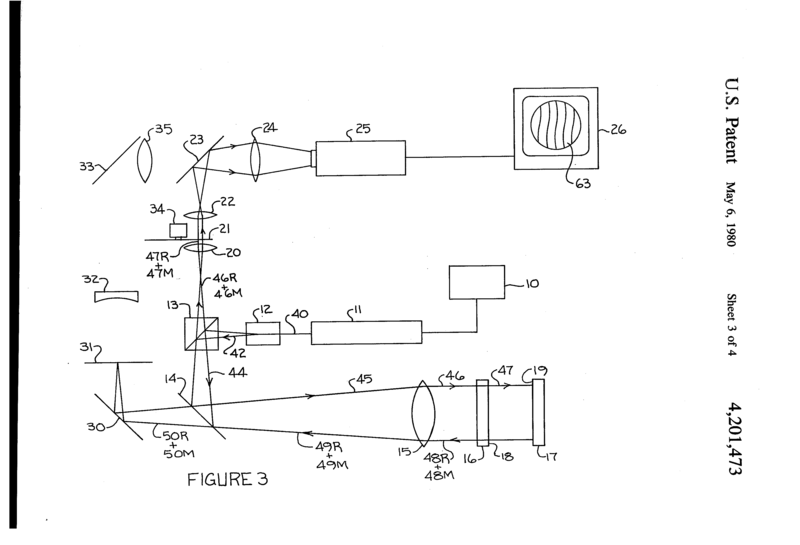 A “White Light Fizeau Interferometer” was created by Professor Schwider in 1997. The light source was a broadband source with spectral content. The unique result was interference fringes a fixed distance from the Fizeau reference surface. In order to accommodate the industry’s new demands, the Mark II type instruments had to be abandoned. Interferometers with fixed magnification and low distortion imaging, calibrated image size and high pixel resolution emerged. Integrated workstations were developed primarily in Germany in order to move interferometers out of the quality control laboratory and next to the polishing equipment. 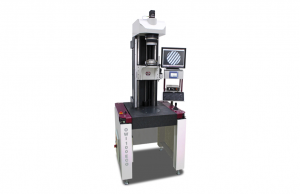 The advantage of a workstation was the efficiency of integrating an interferometer directly into the production process to measure both surface form and radius of curvature easily and occupy as little floor space as possible. 4D Technology introduced a Simultaneous Phase Measuring Interferometer (SPMI) that was the first commercially successful interferometer of its kind. 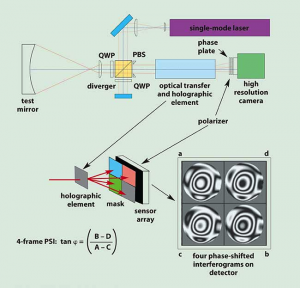 By combining the TROPEL 4-camera approach onto a single detector, the system became robust and easy to use [Novak et. al.]. The expanded manufacture of large mirrors for space and terrestrial application gave 4D Technology an application to establish their business and become a major player in the interferometry market. A different approach to eliminating vibration sensitivity was developed by ESDI [Szwaykowski et.al. ], which introduced the concept of a spatially split source using a high coherency laser in a Fizeau interferometer. This allowed for the simultaneous capture of 3 phase-shifted interferograms. 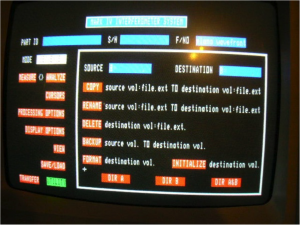 Carrier Fringe data acquisition also became common as simple PC computers became fast enough to acquire and analyze data sets. 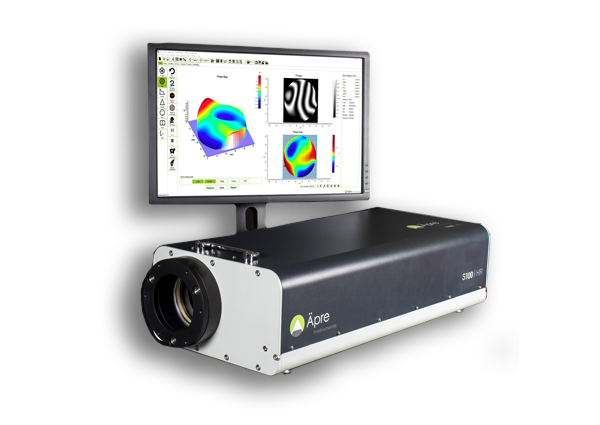 An asphere measuring interferometer was introduced by ZYGO. This was a scanning Fizeau [Küchel] that built up rings of data as the part scanned along its optical axis to measure each asphere zone. The zones were then combined to map the as much of the surface as could be accessed. QED introduced a practical stitching system [Forbes et.al.] to measure steep, approaching hemispherical spheres. Beside more coverage of steep spheres, higher accuracy due to averaging and potentially higher spatial frequencies were being reported. Several modifications to the point source were introduced in the late 1990’s/early 2000’s which attempted to reduce diffraction artifacts caused by dust particles and other imperfections in the optical system of the interferometer. These were based mostly on increasing the size of the source by projecting a pattern using highly coherent light from the laser onto a rotating ground glass. Such sources with a decreased degree of spatial coherency can eliminate coherent patterns produced by diffraction on small particles and can be very effective, especially when such particles are located far away from the imaging plane. 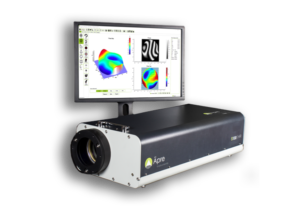 In order to handle measurements of optical components with parallel front and back surfaces, ZYGO introduced a tunable, coherent laser source [Deck] in which the wavelength of light can be swept in a controllable way. This innovation had several advantages: It allowed for analysis of obtained data based on a Fourier transformation. Additionally, separate reflections from the front and back surfaces of the sample could be taken, which allowed for independent measurements of those surfaces. Finally, this method made it possible to take measurements of the optical thickness of the sample. 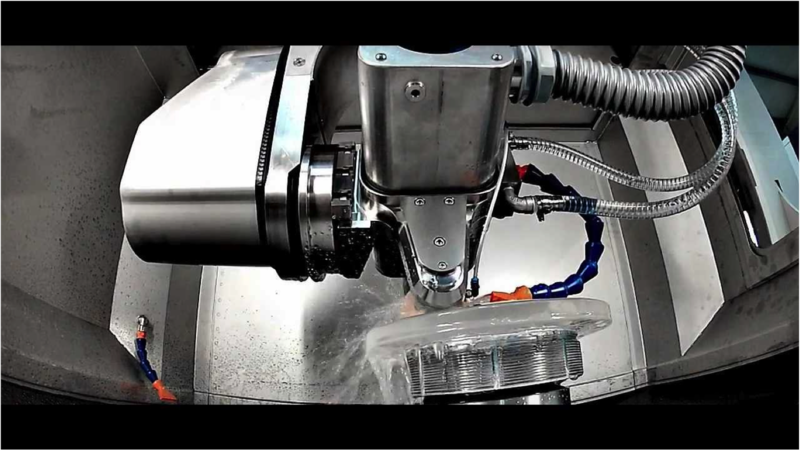 4D technology introduced a system to solve the long-standing problem of errors caused by vibrations in the machine and testing environment while minimizing coherent artifacts. They used a delay line and a synchronous translation of two components: the reference element and one of the mirrors in the delay line to achieve the vibration-insensitive performance in their model of the Fizeau interferometer. The drawback of such an approach was that it led to complicated architectural design. ZYGO introduced the ring illumination system [ Küchel]. It is similar to a method used by Zeiss [Küchel] in their high performance interferometers. The ring increasingly lowers image artifacts contributions to the measurement the FARTHER the artifact is from image plane. So dust near the launch of the illumination beam is more suppressed than in the reference element. At catseye the ring must be reduced to a spot or no interference is observed due to the wavefront flipping. Similar approaches with a simple enlarged dot illumination are also utilized over shorter optical cavities. The dot could be considered temporally coherent and spatially incoherent. CNC polishing machines require rapid and precise feedback between measurement results and fabrication processes. Ideally, an interferometer should be used in a closed loop as a guiding tool in the polishing operation; these needs drive the requirement for low retrace errors, low image distortion, high spatial resolution and acceptance of large departures from “null” condition. The older systems, with Mark II™ legacy 6X zoom optics and intermediate fringe images projected on rotating ground glass disks, are inadequate to support CNC polishing applications. In response, 4D Technology and later ZYGO introduced high pixel count interferometers with better image resolution. These systems have better imaging and higher slope acceptance. ÄPRE S-Series HR interferometers for computer controlled polishing applications or where the highest image resolution and wavefront slopes are required. ÄPRE S-Series SR interferometers are for general purpose optical ship testing. The SR finally replaces the 40-year-old Mark II optical design; outperforming the old design by large measure, without increasing the price to the user. 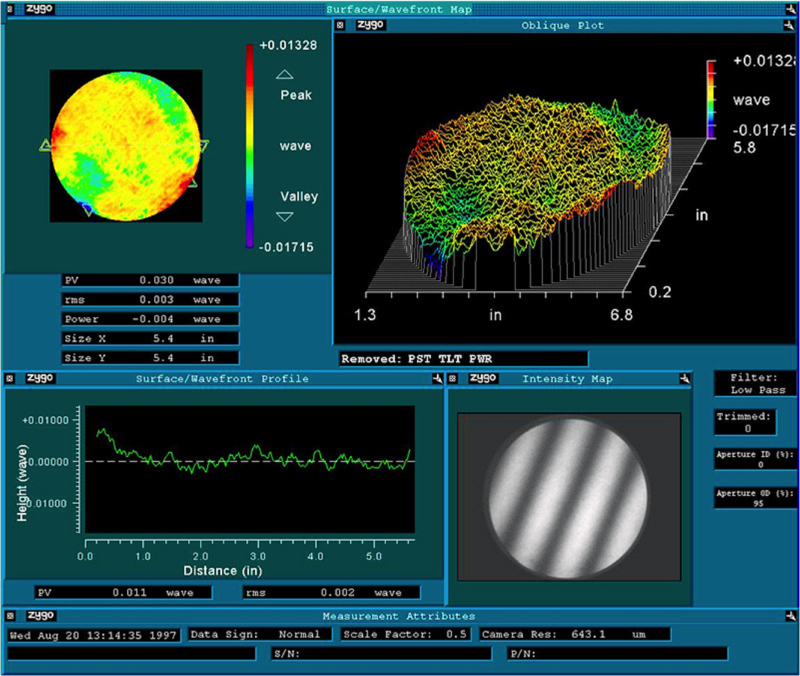 ÄPRE has introduced a practical SCI source [Olszak], a new source modality to Fizeau interferometry. SCI controls the coherence, fringe position (over 100’s of millimeters) and phase modulation of the fringes electronically. SCI aligns in high coherence mode, like a laser, isolates like a white light source, positions the fringes within the cavity, and phase modulates regardless the cavity size, even down to 50um. 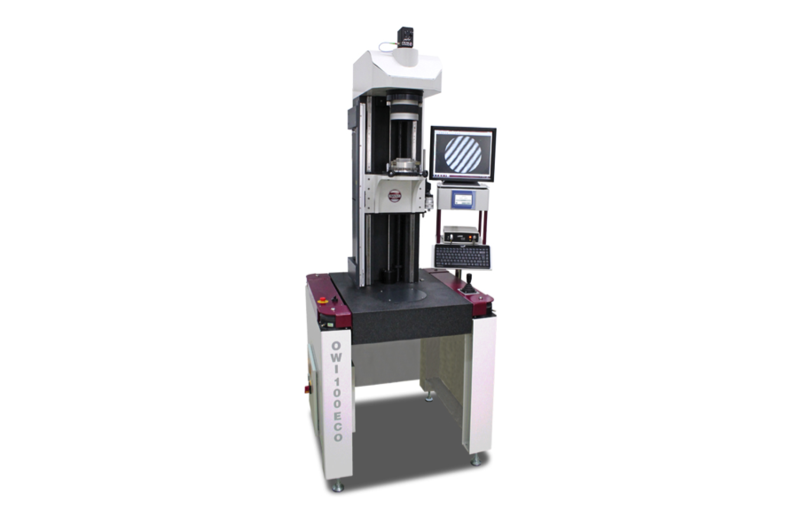 By isolating the surface of interest, accuracy is improved and new applications are enabled. This is a new technology and its impact will emerge in the coming years. Laser Fizeau compared to SCI Fizeau – 1 cm substate with 250 um step in the middle. 4D Technologies introduced a light source based on a coupled delay-line to project low coherence fringes. Working in a plano-cavity it can place low coherence fringes a distance from the TF and move them over ~25 mm range. Isolating the surface of interest. It is not unusual for optical fabrication facilities to develop custom interferometers. Commercial systems do not always meet requirements that may be very specific to a particular manufacturing process. These instruments must conform closely to manufacturing regimes. Many of these systems meet standard technical requirements, while others are truly state-of-the-art and push the limits of today’s technology. Regarding large optics manufacture, these developments are typically well reported in the literature and involve CGH and null correctors combined with commercially available vibration insensitive data acquisition systems. Here, as in CNC polishing, low distortion imaging systems of high resolution enable correction of CGH induced errors. Laser Fizeau interferometers have supported optical manufacture for over 40 years. They will continue to evolve as applications and processes drive the need for change and new technologies enable these changes to be implemented. Final Comment: We welcome your comments or additions to make this history more complete.